Edit note sent by Rachel Japeren: "Note to all editors: An earlier release that reported Phaedo3 had won her class was premature and we apologise profusely for any confusion that might have caused. Phaedo3 was second over the line and is provisionally second on corrected time in the MOCRA Multihull class in the Rolex Fastnet Race. After a long, tactical duel in the uncharacteristically light winds of the 2015 Rolex Fastnet Race, Lloyd Thornburg's MOD 70 trimaran Phaedo3 finished 2nd on the water, mere minutes behind the 131-foot-long trimaran, Spindrift 2. And while the winds may have been light, the racing in the 600-mile long run from Cowes, along the south west coast of England, around Ireland's Fastnet Rock and back to Plymouth was as fierce as ever. 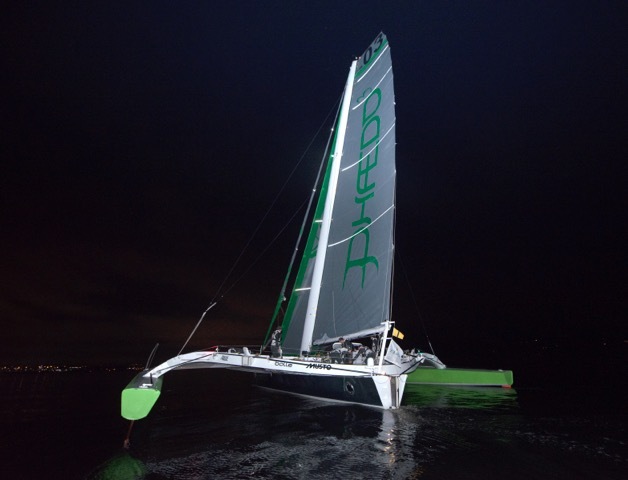 Thornburg, co-skipper Brian Thompson, and the rest of the Phaedo3 crew battled within sight of the maxi trimaran Prince De Bretagne nearly all the way back from the famous rock, and they were only able to pass the larger trimaran just before the finish off Plymouth. “This is the most exciting race I’ve ever done! Between leading everyone out of the Solent and then battling with Musandam-Oman Sail and then Prince de Bretagne all the way to the Rock and making a mistake in letting her by.” In the breeze on the way up to the Rock, Phaedo³ was making 30 knots. “We wanted to get her [Prince de Bretagne] back, but we weren’t certain we could. Then we saw her almost overtaking Spindrift and we thought she might get in first. Luckily they were racing each other which gave us a lane to come in and start catching up. After a long, tactical duel in the uncharacteristically light winds of the 2015 Rolex Fastnet Race, Lloyd Thornburg's MOD 70 trimaran Phaedo3 has won the highly competitive MORCA class and finished 2nd overall, mere minutes behind the 131-foot-long trimaran trimaran, Spindrift 2 (that's nearly twice as big as Phaedo3). And while the winds may have been light, the racing in the 600-mile long run from Cowes, along the south coast of England, around Ireland's Fastnet Rock and back to Plymouth was as fierce as ever. 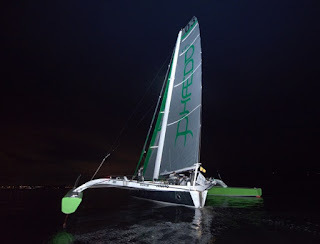 Thornburg, co-skipper Brian Thompson, and the rest of the Phaedo3 crew battled within sight of the maxi trimaran Prince De Bretagne nearly all the way back from the famous rock, and they were only able to pass the larger trimaran just before the finish off Plymouth. "What an amazing race!" said Thornburg shortly after the finish. "We had the much larger Prince De Bretagne and Spindrift 2 in our sights for miles, but we only started to reel them in as as we approached the Lizard. Then it was just a matter of who was able to find just a little more pressure. Anything could have happened as we approached Plymouth. The last 50 miles were absolutely a nerve racking, but I'm so happy and so proud of the guys." 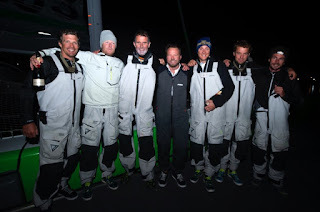 Now that Spindrift 2 has claimed line honors, and Phaedo3 and Prince De Bretagne have finished, all they need to do is wait for the rest of the well over 300 boat-strong Fastnet Race fleet--including the MOD 70's Musandam-Oman Sail and Concise 10, as well as the Jim Clark's 100-foot monohull Comanche, George David's Rambler 88--to make there way into Plymouth. And this win is even more special for Thornburg after the non-stop racing program he's been on since smashing the Caribbean 600 record aboard Phaedo3 this spring. Claiming the fastest elapsed time in the Transatlantic Race. And then winning the multihull class on corrected time in the Transpac aboard his original Phaedo catamaran only a few weeks ago. "All of the races have been special," Thornburg added with a smile. "But winning in such a competitive class in something as iconic as the Fastnet is just a little bit sweeter. We're going to celebrate tonight!"